We are once again turning our focus towards the Paranoia of the Education System and here specifically continuing from the previous introductory blog post in the series on how Standardized Testing is a form of Paranoia implemented into the Education System causing Children to become Beings Trapped by and within the very Paranoia as it has been proselytized into them through the Education System. In the last blog post we investigated how standardized testing was born out of paranoia and as such paranoia has become the very foundation – not only of the usage of standardized testing in schools – but of the education system in itself. The primary problem with Standardized Testing is – as with all things problematic: it’s starting-point. It is a system of measuring, judging and comparing children’s, teachers, schools and countries academic performances with the purpose of making these cost-efficient and competitive on a local and global market. Legislators working with education policies who aggrandize standardized testing claim that the purpose with these tests are to ensure children a proper education and make sure that no one fall behind. One that in particular has been proponing standardized testing is the “No Child Left Behind” act in the US. However a different agenda emerges when looking the way the results of standardized testing are used to determine and differentiate academic tracks, teachers’ salaries and schools budgets. 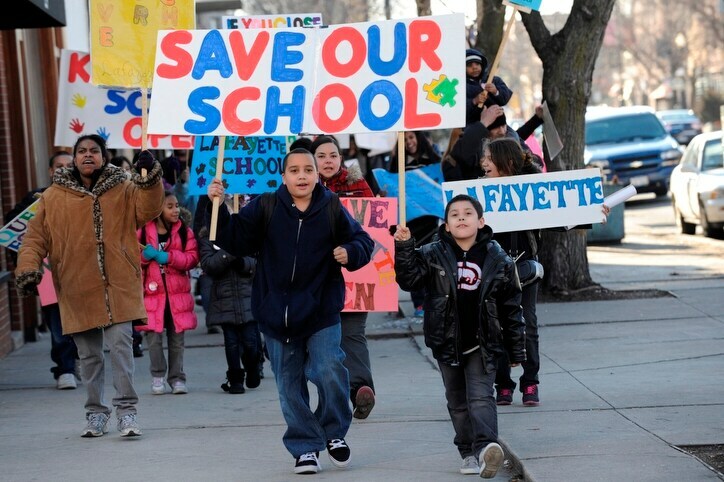 In this video, Chicago legislators are being criticized for closing apparently low performing schools whereof one in particular had proven to be important in the Afro-American community and where even the expert hired to determine which schools should close due to budget restrictions recommended that it remain open. A woman is asked in an interview why legislators would close the school in spite of the recommendations made and she quite pragmatically explains that the school is located in an attractive part of the city with parks and subway stations close by and therefore that the decision made to close the school has been made solely because of the revenues that would come in from selling the property. As such when schools become competitive based on the results of standardized testing of its students (and by implication teachers and faculty) legislators have a ‘legit’ reason and justification for closing schools due to ‘poor performance’ while actually having entirely different agendas than to heighten academic achievements or to support children to get the best possible education. A specific problem with standardized testing when it is used to measure and judge schools performance is that it ironically against its own purpose places focus on failure rather than on success. Furtermore the starting-point of standardized testing – or the principle thereof – can be argued as having been incorporated from the business and industrial world where all results are measured and compared to ensure the most cost-efficient forms of production and thereby ensure profit-maximization for the shareholders in a company. A major difference however between schools and workplaces is that workplaces will fire people if they aren’t performing according to the required standard. The workers have signed a contract and are in exchange of their work receiving a salary and as such they have agreed to a certain level of performance. However in schools students are enrolled without any contract or agreement. Although they are claimed to be entitled to a certain level of educational input (the equivalent of a salary), this is often not guaranteed and they have no choice but to accept the teachers and learning methods that are presented to them, even if these fail to actually assist and support the children to learn. On the other hand it would appear that children equally to workers in a factory or a company can be ‘fired’ based on their measured and compared ‘productivity’. This happens for example when low-performance schools are closed, when teachers are fired and when students drop out of high school. And it doesn’t matter how much work the child actually put into their education or how skilled or intelligent they are because they might not even have the prerequisites to be able to make the tests – especially if they come from an already impoverished and low socio-economic area. It is clear that standardized testing instigates Paranoia in the school system and this paranoia is then siphoned onto the children where a constant fear of failure becomes the general principle of our education systems. In a workplace, the paranoia instigated by standardized testing through comparison and competition is supposed to lead the workers to become more efficient, but this is not the case in schools. When school boards and teachers themselves function based on the paranoia that they might lose their job or their funding they start cutting corners and cheat and the focus in the classroom becomes anything but actually teaching and providing an educational space where children can learn and develop. What is furthermore devastating is that the paranoia that instigated standardized testing in the first place – the fear of losing money – is entirely irrational and not based on a holistic or sound perspective on education. We see this in the business world as well as in education: when the fear of losing money and conversely the greed and desire for more money is what governs our actions, everything else becomes enslaved to this one point and anything of real substantial value becomes secondary if not irrelevant to profit-maximization. And even if schools boards and teachers wanted to promote a different kind of education, they in many cases can’t because they are dependent on government subsidies in one way or another, which in turn has been made dependent upon standardized testing. The solution to the problem of how the paranoia of standardized testing instigates fear of failure with the consequence of undermining and compromising actual education is simplistic: What requires to be changed is the starting-point with which standardized testing has been integrated into the education system as a tool of comparison and competition. Money does not belong in school; the school system shall not be a part of the business or the industrial community. Nor should schools educate solely for the purpose of preparing children to be competitive patriots on a global economic market. Education is about providing an environment for children to develop themselves in to become effective human beings. However in the current world system, children are like all of us seen as nothing but figures and numbers whose development is limited to them becoming consumers and wage-slaves functioning solely to keep the machinery of profit-maximization in motion. This has become the value of life and therefore the value we place on children’s lives where it is evident that life itself isn’t valued at all. Testing one’s skills and preparing oneself to enter the system, as it currently exists is certainly important. But it is even more important that children are educated to value life and to become caretakers of this planet in equal respect and consideration for what is here. This is why we are suggesting an EqualMoney System as a solution, because through such a system, corporations and companies will be placed within the role they should have in the system, to function as production and dispersing facilities for the resources and products on earth and not that which governs and direct our lives. Within taking money out of the school system, we will be able to develop testing methods that are holistic and as such take all aspects of a child’s life and development into consideration. Schools won’t have to compete within a paranoid fear of failure because of money because we will change the starting-point with education entirely to focus explicitly on creating the best possible educational environments, not only for children but also for all of society. As such the evaluation tools won’t be based on fear and they won’t instigate paranoia as a method of motivating people because what we are seeing now clearly show that this isn’t working. We can’t intimidate each other through fear to grow, develop and expand ourselves. The purpose of schools is to focus on providing the best possible education to ensure that children are able to grow up and develop themselves to become responsible, caring and dignified human beings full of life, self-expression and understanding of the world they are living in. For that schools shouldn’t have to worry about money – but should function under an equal and common budget based on a commonsensical assessment of what is required in a particular environment. Children should be able to test themselves in an environment without fear or paranoia so that no one will have to cheat or scheme or bully others to get by – but where testing becomes the tool it was supposed to be: an actual assessment of one’s abilities with the purpose of assisting oneself to expand and grow academically as well as in life in general. Implementing an EqualMoney System where life is valued and where all other parts of society functions to make sure that life thrives in equality will ensure a school system of continuous expansion and development where all parties involved will be participating of their own free will. And ironically so – in a ‘free market’ system that is not possible. So please give yourself, your children and every future generation the opportunity to experience a system where your life and development is supported from the moment you are born through voting for an EqualMoney System. Call the Common Core Bullies Out. Just Say No to Standardized Testing.